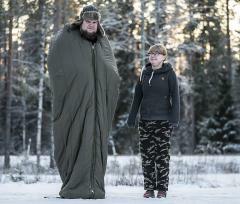 Alright, now you can't blame us for not having sleeping bags for big people. Or if you just want a bag where you can move around on your own or with someone else, we suggest taking a look at this. Savotta is a long-time contractor for the Finnish army. 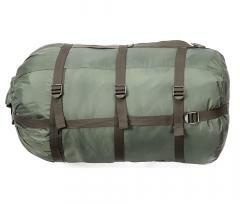 Along with military kit, they produce high-end civilian stuff too, like this super roomy sleeping bag. 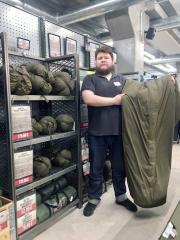 While this might look like the carrying bag for the world's biggest football, the Yukon is actually just like any mummy type sleeping bag, but bigger: about 2 m circumference and 2 m length should suffice for the hungriest of men. However, if you are close to 200 cm tall, you might have to bend your knees a bit to be comfortable. Sleeping bag’s two-layer structure provides both warmth and dryness, because it is designed to keep moisture outside of the sleeping bag. And this thing really is warm - you should survive in up to -30 degrees celsius, according to the manufacturer. Of course common sense applies, don't sleep in the snow and all that. Comfort rating maybe something like 5 to 10 degrees below zero. This bag packs surprisingly small for being so roomy. When stuffed in the provided compression sack, the measurements are about 31 x 55 cm. The package weighs just under 3 kg. The straps on the compression sack are a tad short, so you'll have to fight a bit to get them properly tightened, but otherwise the sack is OK - keeps water out from every direction and the size is good. The outer fabric is made of water- and dirt resistant Ripstop nylon. Bag is filled with silicon impregnated fibre. It's like polyester, but better. You can wash this at 30-40 degrees celsius, but we'd recommend keeping it to a minimum - every wash takes a bit off the insulating capability of the bag (this goes for all sleeping bags). Use a liner bag instead and wash that when needs must. Designed in Finland, made in P.R.C., which is a trendy way to say 'China'.